A red carpet trips up to the stage, where a light box stamped with the ubiquitous clocktower logo fades from purple through to orange. 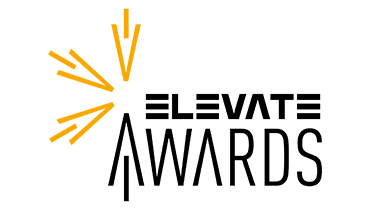 The awards themselves, miniature clocktowers in green, red and gold, rest demurely atop a soft-lit podium... David Charles blogs about the events of the Elevate. Daylight saving kicked in last night, marking the official start of winter, but inside the Dom it's t-shirt weather for runners, nominees, cameramen and crowd. That big event buzz hums around the cave; a tired-but-happy festival buzz. A red carpet trips up to the stage, where a light box stamped with the ubiquitous clocktower logo fades from purple through to orange. The awards themselves, miniature clocktowers in green, red and gold, rest demurely atop a soft-lit podium. A barrel-chested man, in a suit with a black shirt and a red tie, takes the stage. Herr Hermes looks like a 1950s labour politician, but is actually a comedian: "There are three cameras here tonight - welcome to the NSA live stream!" The co-organisers of the festival, Daniel Erlacher and Bernhard Steirer, join Herr Hermes and explain why we're sitting here. "We do a lot of talking," Daniel says, "but we must not forget the extremely committed people out there fighting for great causes. This is an opportunity to thank them." It makes me wonder: what is the point of awards? It makes the winners feel good about their work. The cash prize of two thousand Euros would help too. It might also raise the profile of the winning organisations, as well as those nominated. It reminds us the audience that there are other people out in the world doing inspirational things. But perhaps it also isolates us from taking responsibility for them: we can invite a group of refugees onto a stage and we can applaud them, feel good about our applause and walk away with a smile on our faces. And what about the effect of the awards on the losers? Do they suffer for having been almost recognised? And what, for that matter, about the effect of triumph on the winners? Arrogance, lost focus, the divisions of fame? But as an entertainment and as a coda to the hard work of the festival, the awards are a success. They bring the delegates together for one last celebration of all the things that struggle has achieved in the last year. The process of nominating, selecting, voting, awarding and celebrating leaves us feeling inspired and energised for the year ahead. As does the zirbenschnapps. I won't go into the details of all the nominees because I couldn't do them all justice and they are all worthy of our applause. Check the links at the bottom of the page. For the presentation of the international award, though, a familiar member of the jury comes on stage: Jacob Appelbaum. His words are a fitting conclusion to the festival: "Each of our struggles are interconnected," he says. "When we support others through solidarity, we strengthen our own causes in ways that we can't imagine." The winners of the international award are a refugee protest camp in Vienna, a cause that is obviously of special interest for Jacob, an exile himself, albeit a highly privileged one. "The police won't beat you until you're dead," he reminds us, "but they would do that to a refugee. It helps to stand with those refugees in solidarity, to use your privilege in a useful way." The three representatives from the refugee protest camp are humble in their defiance. "I would like to thank you very much for this kind of honour," one says, "because people don't like us." Three young refugees stand on the red carpet with a gold clocktower and a cheque for two thousand Euros, embarrassed in the applause. "This award is not only for us, this award is for all people who fight for human rights."